Hey guys! Sorry I’ve been MIA, beauty wise, but school has been pretty hectic. So today, I wanted to do a post about spring trends that I’m loving. Obviously, there are more than what this post shows, but these are ones that I would/do actually follow. This is my first time doing a post like this because I don’t really find myself to be up to date on fashion, but I’m just going to jump right in. 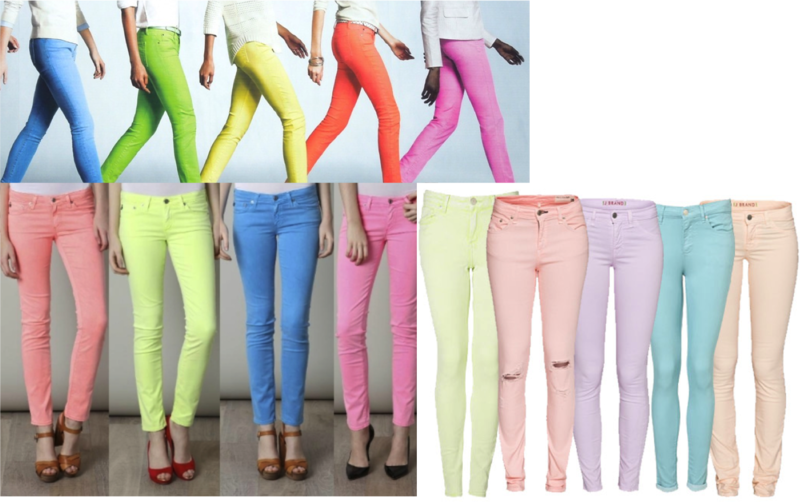 I love color pants. I have about 3 pairs myself, but I really want to try to Skimmers from Gap. I love color pants because they can pull an outfit together. It replaces everyday denim with a nice pop of color that makes it seem like you put a little more effort in to your outfit. In general, I really like that romantic, girly look. With the bows, sheer, soft, neutral fabric, and lace! I’m absolutely in love with lace and lace detailing. A while back, I was obsessed with lace. Everywhere I went, I saw it and I had to have it. I have maybe a hand full of lace items, but I love all of them. I was worried that having these items would be bad because when they went out of style, I wouldn’t know what to do with them, but luckily they’re still in style. So when I first saw Taylor Swift with here cat headband in 22, I thought it was super cute, but not something I would really wear. Same goes for bunny ears. I kinda thought it would be deemed as more for costumes or younger kids. Luckily though, it seems that these accessories are making it big, which justifies wearing things normally associated with kids. Also, while this cutesy look is just coming in to style in America, it has been big in Korea, home to everything cute, for quite some time. With that being said, if you’re interested in these accessories, I would advise looking at Ebay and other sites where they sell cheap Korean accessories. As for the headband, I sell it at Forever. I’m going to be completely honest and admit that before this season, I had no idea what chambray was. I think I saw it online or on tv and was totally confused. When I saw it, I thought it was the same thing as denim. I didn’t really think much about it even after doing some research, but then I started seeing it everywhere. I saw an especially cute top that also incorporated florals in a TJ Maxx ad. I have a denim shirt, but nothing chambray, so hopefully, I’ll be able to pick something up soon! Once again, sorry I haven’t updated in a while, but hopefully I’ll get back on schedule soon! I hope you enjoyed this post and if you want more, be sure to like this!